As we mentioned earlier today, it appears Loot Crate are slowly getting their orders back on time, as the last day of September we got our Loot Tees for the month. 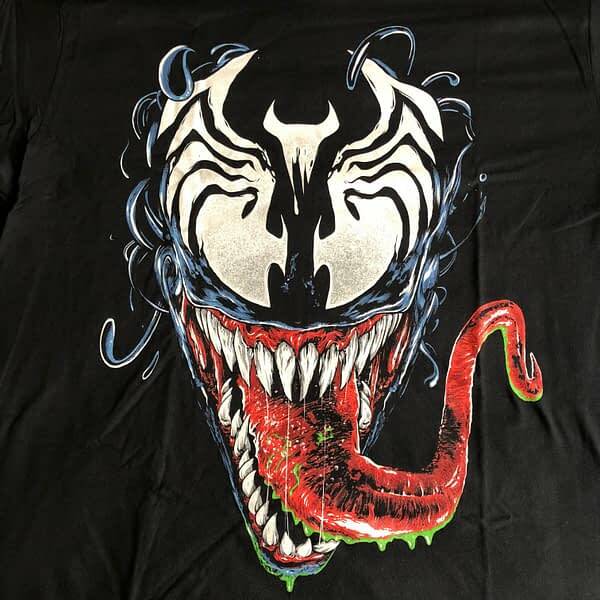 This time around we got another movie tie-in with a Venom shirt. This is a pretty awesome design that takes me back to the ’90s when people were wearing Venom on all their clothing as if Spider-Man died and this was their new mascot. (This was also when Spawn was popular, so bare with me.) You get an amazing piece of art from Anthony Petrie who captures the symbiont well, using his eyes as part of the symbol we’ve known him for over the years. This is a really cool shirt, but it’s also one of those things where it’s paying homage more to the comic book version more than the film. I like that, but at the same time, you obviously have released this with the film, so why not go with the film version? All that said, this is a very good addition to the Loot Tees line from 2018, an awesome shirt to have in time for October, and it gives me added anticipation for the next box to arrive in October.